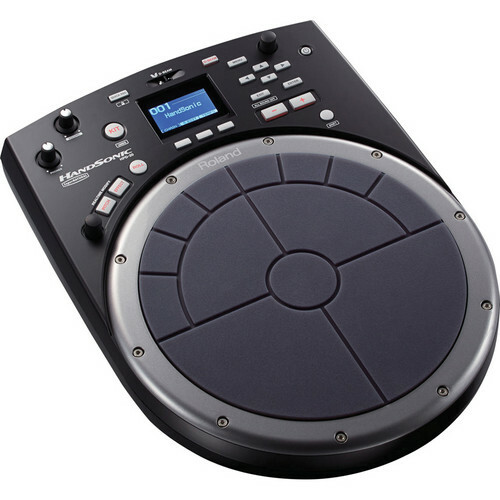 The HandSonic HPD-20 Digital Hand Percussion Instrument from Roland is a velocity sensitive percussive digital instrument with a 10" pad divided into 13 sections. It can be used to trigger a variety of sounds, including the 850 sounds built in, as well as up to 500 of your own WAV files. Each of the sounds can be edited, allowing you to tweak such parameters as volume, pitch, and decay. In addition the HPD-20 has 25 effects for further shaping and warping sounds. Further control is provided with the unit's D-BEAM, roll button, and modify knob. The HPD-20 can also be used to provide MIDI control over third party virtual instruments or DAW software thanks to its USB port. Its TRIG IN jack allows you to integrate other Roland drum pads to use your V-Drums to trigger sounds on the HPD-20. Box Dimensions (LxWxH) 17.7 x 14.8 x 6.8"